To get the most out of your Dhaka trip, never travel to Dhaka before reading this efficient travel guide. The overwhelming capital of Bangladesh, Dhaka offers the visitors a unique atmosphere that is blended with cultural richness and authenticity. The cultural, commercial and educational hub of the country, Dhaka can be considered as a metropolitan within the country limits and it is home to almost 14,4 million people. Some cities in the world have a culture that is shaped around one major root however it is not possible to say the same for Dhaka. The city has been home to many different civilizations and countries. It is possible to see artifacts from the Mughal Empire on a street and then come across to some exquisite examples of British architecture that has been preserved since the British Colonial Period. Dhaka, because of the population and the surface area is one of the most densely populated cities in the whole world. If you are visiting the city from Western Europe for example, get ready to cross a red light with hundreds of other people with you. Just as the same in the rest of the country, people from Dhaka are extremely nice and friendly; you are going to be introduced to a new form of warm bloodedness and you are going to like it. The weather in Dhaka may be challenging if you are not used to hot and humid air. Since the country is under the effect of tropical weather, the temperature gets around 20 degree when it is the coldest. The months between April and September are the hottest and most humid times of Dhaka. No matter what your purpose of travel to Dhaka, you will not be able to leave this city without being mesmerized because of its uniqueness. Get ready for a journey in which you are going to be introduced to not only a new city but also a new world. 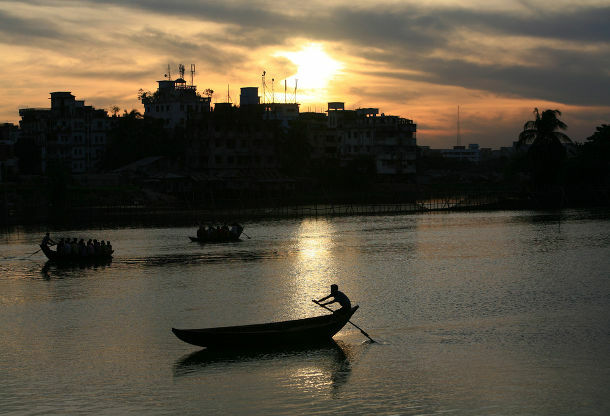 Dhaka, located in the south central part of Bangladesh, is on the north of the Buriganga River. How to get to Dhaka? Hazrat Shahjalal International Airport is located in north of the capital, 20 km away from the center of Dhaka. It is the largest international airport in the country and serves a large number of domestic and international flights. The airport also serves to Bangladesh Air Force. The most common mean of transportation used to get to the city center from the airport is hiring a cab. Auto rickshaw is also another option however since they are not permitted inside the airport area, you have to walk a bit to find one. Bangladesh Parjatan Corporation is operated by the government and offers bus services between the airport and Dhaka city center. How to get around in Dhaka? The main mean of public transportation in Dhaka is done by cycle rickshaws or auto-rickshaws. They are pretty efficient especially if you are going a short distance. However, making a negotiation about the money you are going to pay is recommended since you are going to be foreigner there. Other means of transportation in Dhaka includes taxis, buses and cars. It is hard to hire a taxi right on the street in the city center, therefor asking help from your hotel to book one in advance may be helpful. Buses go along some major parts of the city center however they are usually very crowded so don’t expect to get a seat if you decide to travel by bus. Buying a ticket prior to the journey is essential. Renting a car is also possible in Dhaka however if you are not familiar with how to cope with traffic jams, it is not recommended. Dhaka offers a wide range of attractions to choose from. If you are not familiar with the culture of Bangladesh, every step you take in Dhaka is going to take you another attraction. From historical points of interest to glorious religious buildings, genuine shopping areas to diverse excursion options, this city has all you may ever want and more. Your sightseeing in Dhaka is going to include a bunch of religious sites. Dhakeshwari Temple, Holy Rosary Church and Saat Masjid are the most famous ones in the city. If you would like to visit museums while you are in Dhaka, you have options to choose from. Bangabandhu Memorial Museum, Liberation War Museum, National Museum of Science and Technology and National Museum in Dhaka are all rich in content and guarantee not only enjoyable but also informative time. Ahsan Manzil, aslo called the Pink Palace is one of the buildings you have to include in your must see list when in Dhaka. 1857 Memorial and Lalbagh Fort are also popular among the visitors. If you feel like spending some time in the greener part of the city, then you can visit Baldha Garden or National Botanical Gardens. The investments made in Dhaka in the recent years has changed the city’s everyday life clearly. The city still offers traditional shopping experience in bazaars or open air markets to its visitors, however it is also possible to shop in malls in Dhaka, too. Basundhara City and Jamuna Future Park are the most famous two of these. Still, if you want to stay away from malls when you have the chance to do some traditional shopping, there are many places you must check out in Dhaka. Banga or Bango is the most well-known of these where you are going to see thousands of stalls selling various items. Keep in mind that it is always crowded since not only the tourists but also the locals visit there on daily basis. New Market on the other hand is a bit pricier but definitely a more relaxed shopping area since it is more spacious when compared to Banga. You can find a large selection of leather goods, jewelry, linens and handmade goods there. If you are determined to try some local dishes in Dhaka (and you should be), Old Dhaka is the place you should head to. The place is filled to the brim with food stalls and small scale restaurants that serve traditional food. Still, if your stomach is sensitive to unfamiliar ingredients or too much spice, it may be wise to check what you are eating since the hygiene standard may be far away from what you’d expect. If you don’t feel like stall food, then head to Gulshan or Banani, two famous districts of Dhaka. There you will find not only better Bangladeshi restaurants, but also a large selection of others that serve some of the best examples of world cuisine. Most of the restaurants stick with the buffet style serving but you can also find a la carte ones as well. Uttara and Dhanmondi are also the two other regions in the city where you can find some good restaurants to dine. If you get tired of walking or getting stuck in the traffic, then you can hop on a boat and enjoy the view from Meghna River. It is a popular excursion among the visitors and some of the tours also include a short stop in Sonargaon, which is the old and historic maritime in Bengal. If you are interested in trying something totally new, then you can join a tour to Dhamrai. The place is famous for the pottery and you can visit and join a lesson to see how good you are at creating a something. It is also a great way to see the more traditional side of the city. Thanks to the investments made in Dhaka in the recent years, the city is becoming more and more powerful in world’s event tourism scene. Every year the city is visited by people whose main purpose is to join international congresses, conferences, symposiums, trade shows or fairs held in Dhaka. The construction of venues and hotels which can meet the needs of every type of traveler help Dhaka’s increasing reputation as much as the city’s natural charm contributes to it.